Brandy Antunez created this elegant, traditional up do with veil for new July bride, Danika. From boho flower crowns and romantic braids to traditional up-dos including veils, a bride’s hair should be an extension of her personal style and the creative vision she has for her big day. Meridian Salon has several hair stylists who specialize in bridal and formal event hair. Most recently, our own salon manager, Danika, walked down the aisle styled in a formal up do by hair stylist Brandy Antunez. 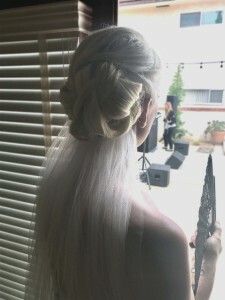 Extensions were added to Danika’s shoulder length platinum blonde hair to achieve this elegant look. 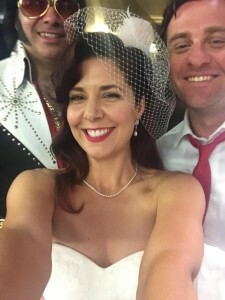 Nicole wanted a vintage style for her Elvis themed wedding. Her custom fascinator created by hair stylist Amber Dawn Close – the perfect finishing touch. We’ve also had fun requests including a vintage Elvis inspired wedding this Spring. Hair stylist Amber Dawn Close created a custom fascinator to complement the bride’s vintage tea-length dress. Planning your own dream wedding hair? We’d love to see your Pinterest Boards! Call for a consultation and trial with our experienced stylists.